We’d love your help. Let us know what’s wrong with this preview of Unreal Elections by C.S. Krishna. To ask other readers questions about Unreal Elections, please sign up. A funny read taking potshots at all major political parties of India, especially the Congress. The writers give their own hilarious version of the inside working of the political parties. Some parts of the book, like the cabinet shuffle and the omission of Manmohan Singh, were simply awesome. Even the inner party fighting of the BJP and the confusion among the leaders of the Third Front is shown in a funny way. The working of the media and their inclinations towards certain political parties is A funny read taking potshots at all major political parties of India, especially the Congress. The writers give their own hilarious version of the inside working of the political parties. Some parts of the book, like the cabinet shuffle and the omission of Manmohan Singh, were simply awesome. Even the inner party fighting of the BJP and the confusion among the leaders of the Third Front is shown in a funny way. The working of the media and their inclinations towards certain political parties is also highlighted. The best parts of the book are the middle overs and the post match presentation. The post match presentation, where all the secrets are revealed is the most interesting part of the book. The authors get preachy in the last chapter, but the reader hopes that the real situation becomes what is described in it. As soon as I saw a book being published by the Unrealtimes, I knew I can't give it a miss. Wanted to enjoy every page of it and savour the moment while reading it. I did enjoy it. However, being a regular reader of the unrealtimes, I found this book more of a compilation of old and new, similar jokes. It feels like all those jokes have been taken and finely woven into a story. That's not to say that there were no more original additions. In fact, some of the chapters were truly hilarious and tot As soon as I saw a book being published by the Unrealtimes, I knew I can't give it a miss. Wanted to enjoy every page of it and savour the moment while reading it. I did enjoy it. However, being a regular reader of the unrealtimes, I found this book more of a compilation of old and new, similar jokes. It feels like all those jokes have been taken and finely woven into a story. That's not to say that there were no more original additions. In fact, some of the chapters were truly hilarious and totally new (chapter 13 being my favourite || all are new but feels similar to old jokes). But then, such instances were far and few, at least for me. Maybe since these guys (authors) are so talented and witty, expectations were high. I don't know, maybe caricatures would have been really good addition. Somewhere, I felt that the X-factor was missing...or something was amiss. I won't say, I was disappointed by the book. I liked it, enjoyed it but not the way I expected it. I would recommend it. One of the funniest books I have read in recent times. 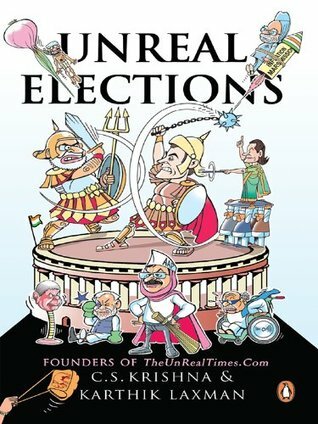 Unreal Elections is a satire on Indian politics set before the run up to 2014 general elections. Being a regular reader of Unreal Times, I kind of knew what to expect from this book. It was a funny read taking potshots at major political parties. Some parts of the book were hilarious especially cabinet shuffling, confusion in BJP, third front meeting made me laugh out loud. Ending was amazing. I liked how the authors used Ravi Shastri's commentary, Karan Johar's Koffee with Karan in political sc Unreal Elections is a satire on Indian politics set before the run up to 2014 general elections. Being a regular reader of Unreal Times, I kind of knew what to expect from this book. It was a funny read taking potshots at major political parties. Some parts of the book were hilarious especially cabinet shuffling, confusion in BJP, third front meeting made me laugh out loud. Ending was amazing. I liked how the authors used Ravi Shastri's commentary, Karan Johar's Koffee with Karan in political scenario. The contest between Modi and Rahul was creative and fun at the same time. I must admit that i had never heard on UNREAL TIMES before the book. I picked up this book because i was following the elections on TV, paper (everywhere) and this book promised to provide comic angle to the elections. The personalities given to the politician and pretty imaginative. The Facebook chats in between did not entice me much. although the book is a very fast read and provides a very good pic I must admit that i had never heard on UNREAL TIMES before the book. although the book is a very fast read and provides a very good picture of the state of current Indian government. At some place you really feel like India needs a revolution and things like Vote-bank politics,Dynasty rule, regional parties , corruption need to be eradicated. The thought that we have moved from British Rule to an equally bad state now is disturbing. This is the first satire book I've ever read and what an exciting one it has been. Satire + Real events in Indian politics = Total entertainment. Thoroughly enjoyed. Revenge of Pranab Da and Manmohan was just awesome. Super human Rahul baba and dark secrets of Modi. Congress syndicate, the fourth estate doing away with 2002. They had it all in book. At times it seems overdose of satire dragging a bit too far, but right in the next page I would end up with a ROFL moment. Must read for people inter This is the first satire book I've ever read and what an exciting one it has been. Satire + Real events in Indian politics = Total entertainment. Thoroughly enjoyed. Must read for people interested in Indian politics. Political satire at it's best.. It's like the funnniest version possible of 'Politics for Dummies'. It sparks an immediate interest in the inherently boring subject (to a few people like me). A brilliantly portrayed epic saga of Indian politics especially pertaining to the 2014 Lok sabha elections of the largest democracy in the world. Sir, novices like me are thankful for creating a curiosity bordering on interest for Indian politics, with all its twisting and twirling political attributes and Political satire at it's best.. It's like the funnniest version possible of 'Politics for Dummies'. It sparks an immediate interest in the inherently boring subject (to a few people like me). A brilliantly portrayed epic saga of Indian politics especially pertaining to the 2014 Lok sabha elections of the largest democracy in the world. Sir, novices like me are thankful for creating a curiosity bordering on interest for Indian politics, with all its twisting and twirling political attributes and unfathomable policies! amazing read !!!!!! the ending is unexpected and love it.!! started and finished it at one go. the author presumably justify the comic they start, with a delightfull ending. they must be really appreciated for churning out an ending that is marvellous. Expecting more from the authors, very soon. Sadly they might run out of topics to comment on, after this elections. ROFL - witty, satire, take potshots at everyone while keeping the script close to actual happening. AAP gets away lightly. More of the 56 chest Would have been good. Something for Raga admirers also. end is profound-ish - may be thats the best way to look at this elections. Can't keep it down - Imagine Ravi Shastri truisms covering Political jousts. Great job. Excellent, hilarious and a great book to read. Once you are through the first 50 pages, you will find it difficult to put down. A total laugh riot :-) Glad that I picked this book. I am giving this book three stars, because the authors did not know when to stop! The early part of the book was good, and interesting. I thought that it was an innovative look at politics and elections in India. I did like the FB chats as well. They were good. Somehow, in the second half of the book, they decided to make the 'competition' bizarre. Introducing a cyborg Manmohan was not needed. I don't know how this fit into the book, nor the last chapter on Rahul the genius, or Modi's fascination I am giving this book three stars, because the authors did not know when to stop! Somehow, in the second half of the book, they decided to make the 'competition' bizarre. Introducing a cyborg Manmohan was not needed. I don't know how this fit into the book, nor the last chapter on Rahul the genius, or Modi's fascination for Jinnah. This is probably a 100 pages too much. Started off very well. It was funny indeed. Enjoyed it quite a bit but it dragged on too much but overall a great work by authors. I used to like the Unreal Times in social media quite a bit in those bizzare days leading up to 2014 elections. Has its moments, but momentum sometimes falters. Overall a good attempt. Hilarious is what I will say. The authors used real characters and unreal plots. Quiet a page turner, guaranteed laugh riot. the book starts off well.....very good in bits and pieces.....but drags in the later half.....but one has to accept they have an amazing sense of humor....good one time read! If you thought you have had enough of the never-ending general elections coverage, think again. ‘Unreal Elections’ will change the way you look at any Indian election coverage forever. A zany, quirky read, the book is the perfect parody and is filled with the usual dollops of humour, satire, suspense and thrill which will leave you gasping for more. The action begins as political parties throughout the country ready themselves for the General Elections. How the ‘big two’ of Indian politics try to If you thought you have had enough of the never-ending general elections coverage, think again. ‘Unreal Elections’ will change the way you look at any Indian election coverage forever. A zany, quirky read, the book is the perfect parody and is filled with the usual dollops of humour, satire, suspense and thrill which will leave you gasping for more. The action begins as political parties throughout the country ready themselves for the General Elections. How the ‘big two’ of Indian politics try to outdo each other (with hilarious outcomes) forms the crux of the story. The book has its fair share of suspense and riveting action as well. For those who like action flicks, there is a masked vigilante gliding through the streets at night and there is also a dose of the ‘Terminator’ so wittily incorporated into the content that it blew my mind away. Additionally, you get a unique yet hysterical glimpse at the way the BJP and Congress offices function. You see Amit Shah in Kofeee with Karan and also briefly get to see Mamata Banerjee and her hatred for ‘Maoists’. But most important of all, you finally understand why Manmohan Singh has been ‘silent’ over these many years. Although the ending was a bit of a dampener, I loved the book overall. Unreal elections is a satire focusing on political events leading up to the 2014 Indian general elections. The book is a mix of real events, dramatization of real events and authors' imagination trying to decipher it all. The book swings between being brilliant and good. The satire on the real events is spot on - not loud, very witty and full of nuances. The writing style around the real events and their dramatization is very tight as well. Even if you follow The Unreal Times handle on Twitter, t Unreal elections is a satire focusing on political events leading up to the 2014 Indian general elections. The book is a mix of real events, dramatization of real events and authors' imagination trying to decipher it all. The book swings between being brilliant and good. The satire on the real events is spot on - not loud, very witty and full of nuances. The writing style around the real events and their dramatization is very tight as well. Even if you follow The Unreal Times handle on Twitter, the book does not sound repetitive, which tends to be a big problem with the books written by Twitter celebrities. The portrayal of imaginary events and characters, while quite well integrated with the storyline, is probably not as tight as the real ones. Describing these parts, the book tends to veer off track here and there, producing neither laughs nor guffaws. This part however is quite limited - about 15-20% of the narrative. Overall, this is a must read for the bold attempt in this genre. One would think that such a book will tend to cause legal issues for the authors given the nature of the satire - that authors have braved that possibility to be true to their craftsmanship and to their readers itself is a good reason to buy this book. Finally, if you enjoyed the yesteryear Hindi political satire - think Raag Darbari and Shrilal Shukla's other works - good chance you will like this too. The best thing i liked in this book is the way Sonia does cabinet reshuffling, Amit shah's interview to Karan, if you think its to Karan Thapar sorry its to Karan Johar, and the last ten pages are over the top Rahul Baba's realization in Himalayas and the events which unfold after are hilarious, i am on floor literally reading those 10 pages. It began out on such a great note. Godfather references, making fun of Pappu, fictionalized account of how Kejriwal might have got the Vadra papers... but while the popular film references and the lampooning was great both at the start and the end of the book, it was left wanting, all throughout the middle, where jokes became, at first repetitive and then tiresome. The parody was also slightly shallow because it never seemed to move towards more serious topics but stuck only to making fun of the It began out on such a great note. Godfather references, making fun of Pappu, fictionalized account of how Kejriwal might have got the Vadra papers... but while the popular film references and the lampooning was great both at the start and the end of the book, it was left wanting, all throughout the middle, where jokes became, at first repetitive and then tiresome. The parody was also slightly shallow because it never seemed to move towards more serious topics but stuck only to making fun of the characters. In the elections, the Hindutva agenda, riots, etc. were such huge contributors. One could feel their absence. I picked up this book upon suggestion by a friend saying that it is very hilarious. However, I only found it to be sporadically hilarious. The pictures of facebook posts were very interesting, so was the last part, which was about Modi and Rahul locking horns. Before I judge this book as not so hilarious, I would like to point out that I read a poignant non-fiction and another non-fiction book on Indian politics, due to which, I might not have been able to appreciate the book. What more, I could I picked up this book upon suggestion by a friend saying that it is very hilarious. However, I only found it to be sporadically hilarious. The pictures of facebook posts were very interesting, so was the last part, which was about Modi and Rahul locking horns. I started the book with high expectations being a regular follower of the unreal times site but it came out as an average read. The overall story is centered around the buildup to the elections and they have taken potshots at almost everyone especially the Congress. AAP has gotten off very lightly. The best parts of the book was when the authors describe the inner workings of the Congress and BJP around actual events. They have expanded on certain articles published earlier but most of the writin I started the book with high expectations being a regular follower of the unreal times site but it came out as an average read. The overall story is centered around the buildup to the elections and they have taken potshots at almost everyone especially the Congress. AAP has gotten off very lightly. The best parts of the book was when the authors describe the inner workings of the Congress and BJP around actual events. They have expanded on certain articles published earlier but most of the writing was fresh. The ending (with its heavy reference to hollywood movies) seemed more fit to a TVF or AIB video sketch rather than a book. The most precise, succinct, frame by frame representation of the great Indian circus, err politics, which culminated in a parliament election that rippled the entire nation. If reader is unaware of Indian politics, this will intrigue to look up for the comic characters in it and if reader is aware, this will release n number of gas balloons, difference being that laughter will be inside of them instead of helium. P.S. - I never knew that ManMohan Singh can be imagined, let alone considered, as T The most precise, succinct, frame by frame representation of the great Indian circus, err politics, which culminated in a parliament election that rippled the entire nation. If reader is unaware of Indian politics, this will intrigue to look up for the comic characters in it and if reader is aware, this will release n number of gas balloons, difference being that laughter will be inside of them instead of helium.